Highland, Utah County, Utah, is the place I was born and where I lived for most of my first 25 years and have lived since 2003. 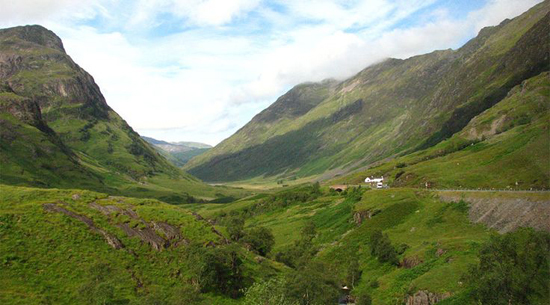 Because my life is linked strongly to this place, I have chosen to set down a few facts about Highland, gleaned from many various sources, including my own memory. Situated at the mouth of beautiful American Fork Canyon on the high bench above American Fork is the lovely little community of Highland. Many families have lived in this community and many people have moved from this little settlement but still love to call it home. It is known for its brisk north winds and high snowdrifts in the winter and the cool canyon breeze in the summer evenings. Highland is a small section of a much larger feature created in Lake Bonneville approx 10,072 yrs ago. The feature extends both east and west of what is generally considered Highland: bordered on the East by American Fork Creek; on the West by Dry Creek, issuing from Alpine Canyon; on the North by the foothills and on the South by American Fork and Lehi. 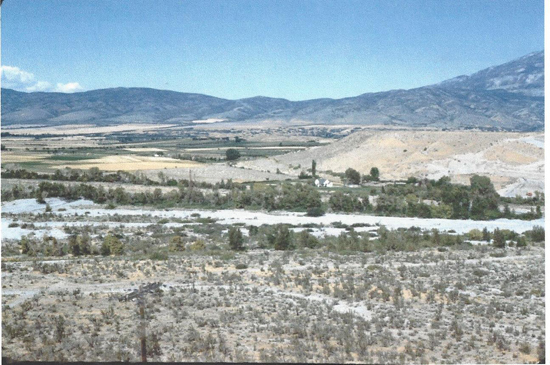 When Lake Bonneville reached its highest level about 5200 feet above sea level, it began to overflow at the perimeter’s lowest spot near Portneuf, Idaho into the Snake River drainage, hence into the Columbia River and into the Pacific Ocean. The overflowing water cut the exit channel deeper and the lake level lowered dramatically (to about 4800’) and the streams from Alpine and American Fork canyons distributed materials into the delta which became the ‘highland bench”. In early writings it was referred to as “the upper bench”, “the upper lands”, “the bench”, “the highland bench”, “the Lehi bench” or just “highland”. The “lowlands” or “bottom lands” were the areas of American Fork and Lehi closer to the Utah Lake. The name “highland” was a natural outgrowth of the general area as it was perceived by the original settlers and predates those who later made their homes in Highland. There doesn’t seem to be an official recognition of “Highland” until the 1900 census when it is referred to as the “Highland Precinct”, although it was given a voting district in 1893. The first homesteaders filed for patents beginning in 1869 and 28 of them were perfected by 1889, with only 9 more perfected in the next 15 years, so most of the settlers took more than the 5 years required to perfect their patents. Many of the early homesteaders didn’t really live on their property but spent the minimum required time there to qualify for the homestead. (Perhaps camping on the property one night every 6 months or so). According to Homestead affidavits, the first homes were built by James Pullen in June, 1870 then Hannah Briggs-April, 1871. John Pool, who has always been credited with building the first home, built his and moved into it in May, 1873. His home was located at about 5860 W 10620 N and there is, close by, a small cemetery containing the graves of five of his children (see details under The People). By the turn of the century there were probably twenty-five homes in Highland. Most Latter-day Saint settlements of that time were closely confined villages, carefully supervised as to structure, site and residents, with small building lots of close proximity within the town limits and farms and pastures located outside the town, sometimes miles away from the owner’s homes, a pattern of occupancy as old as agriculture (and used by the Roman Empire), but Highland was a free-lance settlement, not a result of a “central mind”. No one was “called” to settle Highland-they just did. Highland farmsteads averaged 131 acres whereas in other nearby towns (Lehi, American Fork, Alpine) about 60% of the lots were 10 acres or less. It has been suggested that some of those who moved to Highland were actually trying to hide from Brigham Young so he wouldn’t send them on a mission to some god-forsaken place they didn’t want to go. 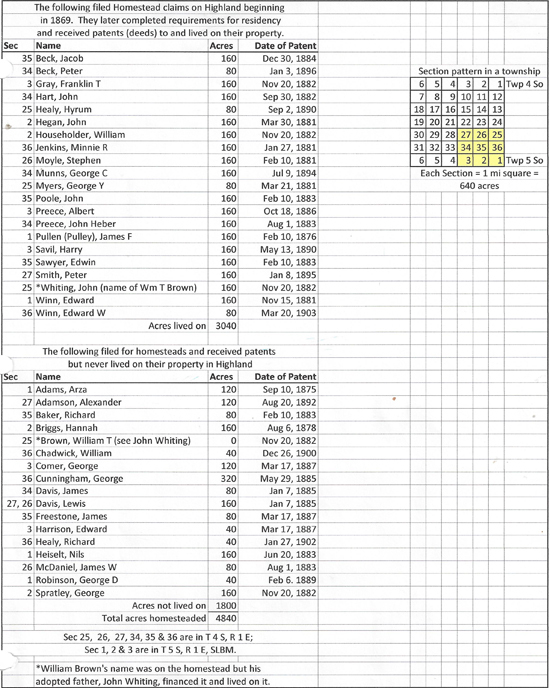 The 1880 census showed the following as heads of households in Highland: Edward Winn, Peter Beck, Jacob Beck, Stephen Moyle, John Whiting, George Myers, John Hegan, John Pool, Minnie Jenkins, Edwin Sawyer, Heber Preece, Ann Preece, Harry Savil, John Hart, Thomas Gray, James Pullen (Pulley) and William Householder. Only the first 6 named are shown still living in Highland in the 1900 census (the 1890 census was destroyed by fire). The 1880 census showed Highland with a population of 88 souls, most of who were members of the Church of Jesus Christ of Latter-day Saints. It is impossible to write about Highland without writing about the Church. In 1888 a schoolhouse was built on the southeast corner of what is now 6000 West and 10400 North, on property owned by John Hegan. Much of that school building remains today-incorporated into the church building that stands there. As the twentieth century dawned on Highland there were 195 people who called it home. That total increased by no more than 50% over the next 6 decades. These 195 residents (an increase of 107 since the last census records of 1880), were in 32 households (headed by males), and included 118 children under 19; 39 people aged 20-39; 31 aged 40-59 and 7 elderly, that is over age 60. 29 of the 32 male heads of households were farmers; one was a Day Laborer, one a Mason and one a Fruit Grower. These heads of households came from England (8), Denmark (3), Sweden (1), Holland (1), Scotland (3), Canada (1), other US States (8), leaving only 7 native born Utahans. Most had come as a result of homesteading. The 1910 census showed 171 residents; by 1930 the population had grown to 280 and the 1940 census showed 310 residents.